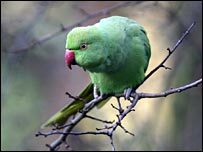 BBC NEWS | UK | Magazine | How do parakeets survive in the UK? How do parakeets survive in the UK? Parakeets are originally from India. So why are they able to survive - and thrive - here? Bedecked with emerald green feathers and a rose-red beak, the ring-neck parakeet brings a touch of tropical glamour to suburban gardens in London and the South East. There have also been sightings in the North West and in Scotland. How does a bird that looks more suited to warmer climes cope in the UK? "They actually originate from the foothills of the Himalayas, so they don't need it to be that warm to live comfortably," says Andre Farrar of the Royal Society for the Protection of Birds. Three factors influence whether a species can adapt to a new habitat - food supply, climate and competition with other species. "From the evidence before our eyes, the answer to whether these birds have successfully adapted is clearly yes," Mr Farrar says. The population numbers about 30,000 across London, and the RSPB estimates it will rise to nearly 50,000 by 2010. In the Big Garden Birdwatch 2006, the ring-neck parakeet was among the 20 most-sighted birds in London, seen in all 33 boroughs and jumping from 19th place in 2005 to 15th. "There is a stable and reliable food supply in suburban gardens for their diet of seeds, berries, fruit and nuts. And there has been an increase in the number of people putting bird-feeders in their garden," says Mr Farrar. But he pooh-poohs any suggestion that global warming might have something to do with the population explosion. "They're long-lived birds and in the 40-odd years that they've been here, they have survived some quite cold winters." He puts the boom down to natural population growth - there are more birds to breed and so produce more chicks. The Government is currently developing a framework for dealing with non-native species - such as the parakeets, Chinese mitten crabs and grey squirrels - and assessing the impact on native species to these shores. As yet, there is no strong evidence that the parakeets are adversely affecting native birds that share similar habitats, such as starlings and woodpeckers. But if the growth of wild parakeets continues at its current rate, there are concerns that they could become a pest to farmers or threaten other wildlife. "Competition for resources would be the main threat," says Mr Farrar. "This is a much wider issue, both in the UK and globally." The introduction of invasive non-native species is one of the main causes of biodiversity loss worldwide, second only to the destruction of habitat. There are a number of sometimes fanciful theories as to how parakeets came to make their home here, such as the urban legend that the birds escaped from a container at Heathrow airport, or from Shepperton Studios in west London during filming of The African Queen in 1951. I studied ring-necked parakeets as part of an Ecology degree at university - they are truly beautiful to watch. The best place to see them at this time of year is the Surrey stretch of the Thames, from Chertsey and Staines to Walton and Esher. I watched several pairs busily collecting nesting material on my way to work this morning. Our studies also ascertained parakeets are ecologically neutral in suburban habitats, so would be more than happy to see them remain! Almost every morning soon after sunrise throughout the spring and into early summer, the trees at the bottom of our garden receive a visitation from up to 50 parakeets. They arrive all at once, spend about 10 minutes shrieking at the tops of their voices and then all take off at once in a brilliant green whirl. The first time it happened, about seven years ago, I could hardly believe my eyes. Now it happens so often it hardly registers and I only notice their arrival because of the dreadful din. What we once thought of as exotic has become so commonplace it barely raises comment. A domestic parakeet escaped some years ago in Rossendale, Lancashire. It has since developed a relationship with several crows and magpies, having been accepted by them. Interestingly, it no longer feeds itself with its claws, instead using its beak like the other birds. Plus, the other birds' vocabularies have improved immensely, demonstrating a firm grasp of tenses, clauses and modern slang. We have them down here in Devon near Newton Abbot. If you hear a sound like an amplified squeaky wheelbarrow in your garden then you have probably got them as well. I spotted one some time before Christmas and nearly called the RSPCA thinking someone had lost their pet, this article explains everything! No parakeets, but friends and I did see an African grey parrot in Hitchin, Herts, at Christmas. I recently moved into a flat overlooking One tree hill in south east London and I see them every other day on the way to work flying overhead and squawking in the trees. If you walk around Nunhead cemetery, a huge old cemetery nearby, they are pretty much the most common bird species there and have completely colonised the place. I have lived in Madrid and I am currently living in Brussels. I have been delighted to enjoy the sight of parakeets in both cities. They are exotic to look at, but what about their unpleasant penetrating shrieks? I wonder what our local birds think of this invasion. Give me a blackbird's song anytime. They love Hyde Park and Kew Gardens, I see them there often. There has been a small flock of these in Studland Dorset for the past 10 years. They make for locals' fruit trees in the summer, especially the plums - rumour has it a couple escaped from captivity and have set up home by the sea. In Amsterdam we have a similar colony of parakeets, they are known to be here since the 1980s. The rumour goes that it all started with an escaped couple of parakeets. Last year the population was counted and apparently there were 3,200 parakeets in Amsterdam alone, and they are spreading over the Netherlands fast. Spotted a parakeet in Denton, a suburb of Manchester. Later someone spotted one in a garden in Derbyshire. There are hundreds of them around here by the river. They do have a loud squawk though! Walking through Hyde Park on Sunday I saw and heard several very loud parakeets and came up with my solution to two problems in one go: if we find out where their nests are, we could steal their eggs/young and then sell then to the pet industry. This would delay any problems with the non-native population explosion over here, as well as providing competition to the rather cruel industry that currently imports wild birds from overseas (let's face it, it's got to cheaper to get some people on ropes up the trees than flying them a few thousand miles).